Armed with a limitless Rolodex and a Benedict Canyon enclave with its own disco, Allan Carr threw the Hollywood Parties that defined the 1970’s. A producer, manager and marketing genius, Carr built his bombastic reputation amid a series of successes including the mega hit musical film GREASE and the Broadway sensation LA CAGE AUX FOLLES, until it all came crashing down after he produced the notorious debacle of the 1989 Academy Awards. 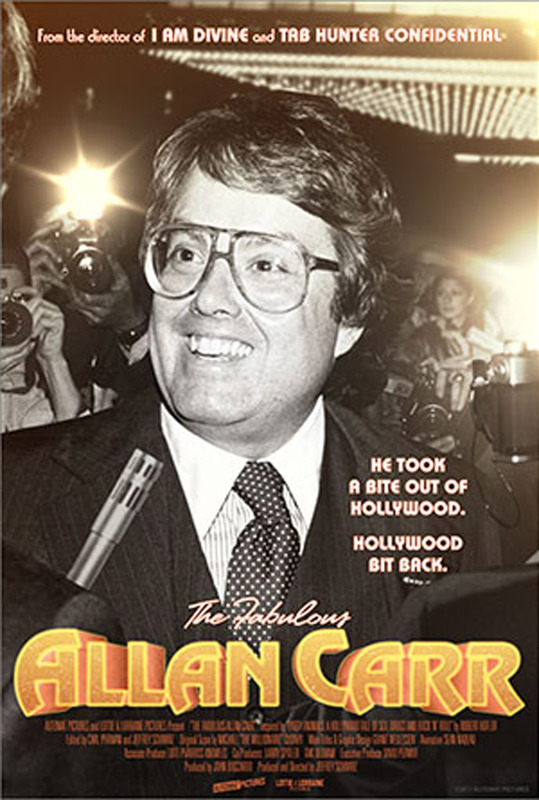 In Outfest’s Competition Documentary "THE FABULOUS ALLAN CARR" from revered Emmy Awarded documentarian Jeffrey Schwarz (VITO, I AM DIVINE, TAB HUNTER CONFIDENTIAL, etc.). I was delighted to discover Robert Hofler’s Allan Carr biography PARTY ANIMALS, and knew right away it had all the elements I look for when choosing a subject. A film adaptation would tie together themes of all my previous documentaries - stories of visionary outsiders (William Castle, Jack Wrangler, Divine, and Tab Hunter for example) who create larger than life personas to make their dreams a reality – all stories of outsiders becoming insiders. The challenge with THE FABULOUS ALLAN CARR was to look beyond the caricature, and explore the inner life of a complicated, contradictory man. It is a story of a star-maker who became a star. In a pre-Twitter landscape, Allan Carr was a master of spin, and knew how to cajole and manipulate the press. He controlled the narrative, even spinning his failures into successes, as long as they kept on talking about him. Today’s obsessive curation of our public personas on social media has its roots in Carr’s celebrity, as we’re all now presenting a carefully crafted image of ourselves to the world. With this film, I also wanted to explore the gay experience in Hollywood in the 1970’s and 80’s – the new freedoms that could be enjoyed, and what the limitations were. It was an opportunity to tell a social history from the era when homosexuality was never discussed and gays sought solace in the movies through the hedonistic 1970’s, embracing the sensual and then the 1980’s when AIDS came along and ruined the party. Although it was no secret that Allan Carr was a gay, he never formally acknowledged it publicly. The word “flamboyant” was often used to describe him, a code word. Using humor and outrageousness to gain entry into a conservative industry, Allan Carr furthered the acceptance of gay identity just by being himself, and his sensibility found its way into his product. The work he produced was infused with a gay aesthetic impossible not to notice today. With LA CAGE AUX FOLLES he presented the first Broadway musical featuring a gay love story at its center. It was a revolutionary portrayal, made more poignant by the fact that it was released at the height of the AIDS crisis. Allan Carr was the last great showman of the 20th century. As a friend of Allan’s says in the film, “He was in the business of making people happy.” I hope this film reminds us of the power of entertainment to bring joy into our lives.